Recently I was researching my grandfather's role in WWI, and I came to wonder how he actually arrived at the Western Front in 1916. I discovered that he sailed out of Brisbane on the ship Commonwealth, departing from Pinkenba on 28 March 1916. 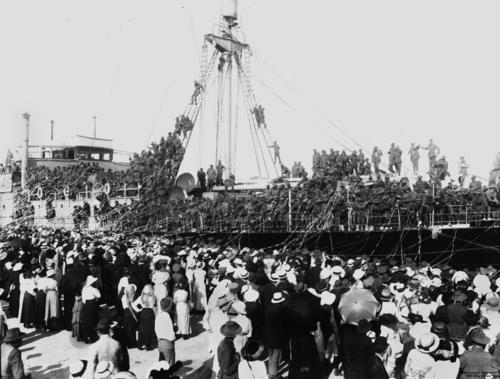 I couldn't find any images of his particular departure, but the following two photographs show WWI troop carriers crammed with servicemen departing the wharves at Pinkenba. Pinkenba - from the Indigenous Turrbal dialect, meaning "place of the tortoise". The name is unusual, and so is the suburb now. The wharves are idle - most passenger liners pull in at Hamilton and cargo vessels at Port of Brisbane on Fishermans Island. The railway station is idle too, shut down by Queensland Rail in 1993 after 111 years. During the Boer War, WWI and also WWII departing troops were transported on trains to this station then marched to the wharves. My grandfather was probably brought down to Commonwealth this way, and my father may well have travelled this way to serve in Borneo and PNG in WWII. The railway station structure remains, but is now surrounded by shrubs, grass, weeds and rubbish. Pinkenba State School has closed and was offered for sale in 2013. I can't tell you whether or not it was sold at that time, but the buildings were still there the last time I looked. There is a set of memorial gates at the school's entrance that commemorate those from the suburb who served in WWII. There is another memorial in a nearby park that remembers those who volunteered for service in WWI. 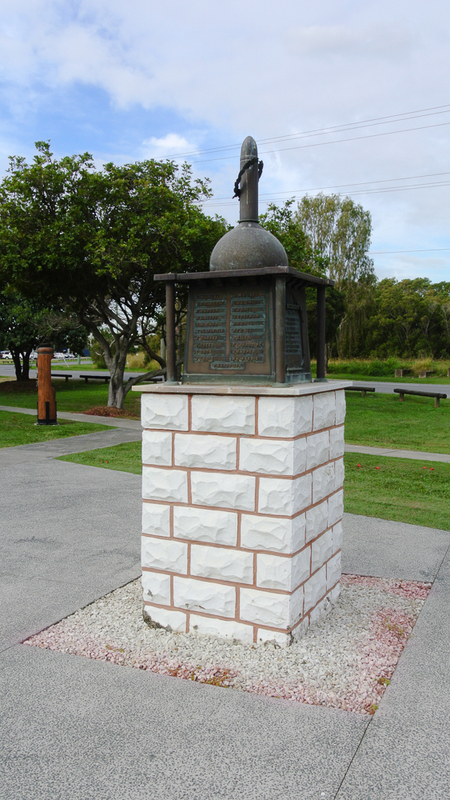 This memorial was unveiled in 1925 and is held on the state heritage list. Here is a current photograph. Here is the memorial at the unveiling in 1925. And they are not the only monuments down this way. On 6th March 1963 the Queen opened a plaque commemorating the completion of the Moonie pipeline that brings oil to Brisbane's refineries. 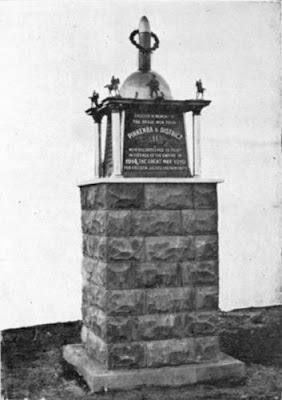 This monument is stuck in the middle of nowhere, its only surroundings a desolate reserve of sorts and a heavily industrialised background. I wonder what the Queen thought when her vehicle pulled up here? There's the monument - set on a brick plinth between the trees at the end of the pathway that cuts in from the right of the picture. Recent estimates indicate that the population of Pinkenba is around 350. Although only a few kilometers from the centre of Brisbane, it is a suburb constrained by industry and the Brisbane River on one side and Brisbane Airport on the other side. Yes, in many ways it is a shame. A riverside suburb just beyond up-market Hamilton, yet almost bereft of facilities. During the war years it must have been a bustling area, but since ships stopped berthing there it seems that it has submitted to heavy industry. What a tragedy when a town dies and all its facilities are either left to fall apart slowly or are razed to the ground quickly. How much sadder if all our important history is lost as well. Pinkenba seems to be in some sort of time warp where life is being slowly withdrawn from the area. It is quite sad to see a primary school with no students that has a forlorn "For Lease" sign on the fence. Similarly railway tracks that lead to a mouldy broken-down former station. The suburb's nearness to the river has been a blessing and a curse. As this is the most downriver you can go I suppose that it was logical for industry to emerge here. The nearby sewerage works and the airport are also limiting factors for residential development. Thanks for the kind words. I love your images of Brisbane! We went to the Anzac day service this year and I thought their was a really good roll up. Maybe 50 to 60 people. Some blowins like us (Our kids Great Grandfather name is on the WW1 memorial), but by far. mostly locals who walked home after the service. 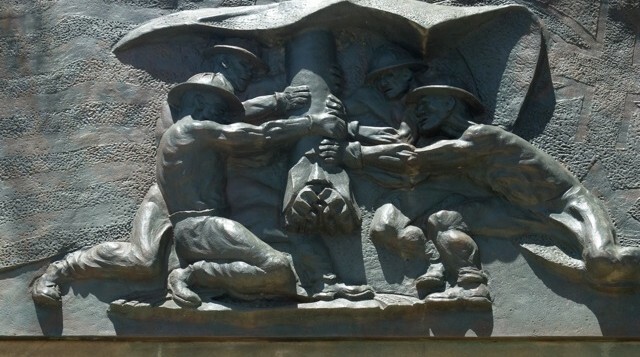 It must be moving for your family to visit the memorial on Anzac Day. Good on the locals for commemorating the day. I grew up in Meeandah until I was 10 as my Dad was in the railway and we lived in a stucco duplex near the level crossing. Dad had 3 jobs to save enough money to build a house in Esker St, Pinkenba. I went to Pinkenba State School from 1964 to 1970. Great area to grow up in. There was even a school further down the road, Myrtletown State School. Not too sure when it closed but think early 70's. I knew a Greg Allnut and I think it was his Mum that did the flowers for my wedding in 1981. My brother still lives in the family home with his family, and my husband also works at Pinkenba. We would collect each other for the walk to Pinkenba Station each morning to go to high school. Some to Hendra, Kedron or St Columbus. Then all walk home every afternoon. Fond memories of the times and lost friendships that were forged over 10 years of schooling. My Grandparents lived at 39 Mcbride Road. I have so many great and vivid memories that were made in Pinkenba. I often go for a dive there , its like stepping back in time, its as though they have never left. I hope it remains for many years to come. PS The local shop across the road had the best Cobbers ever !! My family has lived in pinkenba for 25 years in Esker St. Although we haven't been there that long my sister and I did attend school there and then I went back and did my student teaching there the last year it was open. We even had the opportunity to help back everything from the school up when it was closed. It was sad but also very interesting as we found a lot of archives. Our families go back to Myrtletown and Pinkenba with the Birrers on Mums side and Giuffrida and Dunne on Dads side. Our Aunt still lives on Mcbride Rd in Granny Dunne old house and Grandpa Giuffrida is on Esker st. I used to work with Stevie, and have known Wendy for since I was a very little kid. My mum and dad are still in the house O grew up in in serpentine Rd. My mother's families all came from the Pinkenba/Myrtletown district. Her parents were Thomas Edward Harris and Violet May Smith. Thomas's parents were Robert Harris and Clementina Fenwick. Violet's parents were Henry Smith and Mary Depper/Dipper/Dopper. The Harrises had farms in Harris Road and grew grapes and tomatoes for the Roma Street markets. My parents, Mary Harris and William Paterson were married in the Myrtletown Methodist Church. I remember many happy holidays in my grandparents' home - the house cow and the draught horses. The land and homes were resumed in the 1970s for expansion of the Brisbane Airport. My Great Grandma was Sarah Ellen Harris, daughter to Richard and Margaret Harris. She may have been the sister of the Richard Harris you mention. She married Samuel Arthur Unwin, another farmer in the Eagle Farm area. My Grandad, Ben Unwin, was born in Myrtletown, and his Mum continued to live in Myrtle Cottage, Myrtletown. Would love to hear what information you have to share. At Myrtletown I hope this helps anyone who is interested. My mum and dad still live in serpentine Rd. I worked with Greg Allnutt and Stevie Giuffrida for Randall birthing ships on the river for years. My mum's maiden name is Val Gills and she married my dad Syd Farrer in 86. Both families have been living in and involved with the mytrletown and oh pinkenba communities for generations. I have very fond memories of growing up in pinkenba playing in the paddocks, riding bikes and fishing. It still had a great sense of community in those days. Nice to see everybodies memories. I always felt like a country kid who grew up 20 mins from the city.